If you like a thriving tech scene and delicious coffee, boy, do we have a state recommendation for you! Washington is home to the beautiful Cascade Mountains, Starbucks Coffee, and the big city of Seattle, which is a real tech hub. 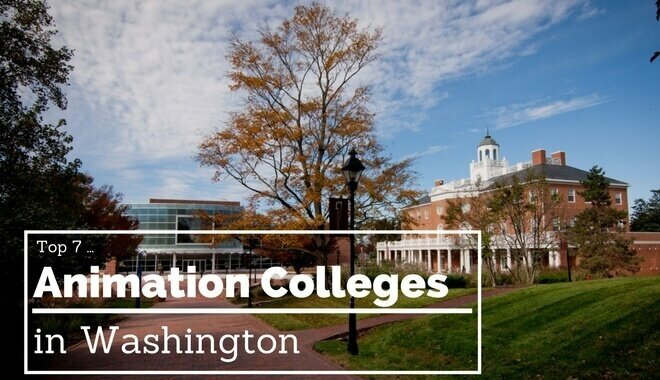 We’ve put together a list of 7 of the top Animation schools in Washington in an effort to make your search for higher education less stressful. Whether you’re considering Washington, or considering a career in Animation, this list is a great place to start. We look at a number of elements when choosing schools to list: tuition pricing, quality of the animation program, faculty accessibility, and overall school quality. The schools selected for our list are top performers in at least one of these areas. Because of our methodology, we don’t rank schools in any particular order. There are many interesting classes to choose from, including plenty that deal with animation: Animation Production Seminar, Computer Graphics, Data Visualization, and more. At the University of Washington you won’t just be keeping up with the industry standard practices, you will be on the cutting edge of the field. To hear the Academy of Interactive Entertainment tell it, “AIE is a specialist games and film educator established by industry with alumni in studios around the world.” They offer several Advanced Diploma options. These courses are typically two years long, and they are full-time courses. If you’re looking for part-time diplomas or certificates you can get in a few months for a couple hours each week, the Academy of Interactive Entertainment is not the place for you. For the Advanced Diploma of Professional Game Development, you’ll learn how to design environments, create characters, and construct vehicles and objects for video games. You’ll learn about different specializations within Game Development, including animation, level design, modeling , texturing. This particular program will afford you the opportunity to build an entire game level, as well as develop an impressive reel of animation and 3D modeling. In addition to Game Art and Animation, Academy of Interactive Entertainment offers a Game Programming Program, as well as a 3D Animation and Visual FX for Film program. At Digipen Institute of Technology, your education will not center exclusively around the latest bells and whistles. Instead, the BFA program will help you develop strong foundational skills. These skills will be applicable in your career pursuits, regardless of the technology that you use. Unlike some programs, the Digipen Institute of Technology expects you to have strong drawing and fine arts foundations prior to entering the BFA program. You’ll be required to submit a portfolio with 15 to 20 samples of your artwork. The drawing skills you possess when you enter will have improved by the time you leave as part of the BFA program. In addition to continuous honing of foundational art skills, you will learn 2D and 3D production skills. The BFA program also teaches modern studio processes and storytelling techniques. Some of these programs (like the BS in Computer Science in Real-Time Interactive Simulations) offer the opportunity for strong programming skill development, alongside the artistic elements of design. If you’re interested in programs that include physics, programming, maths, and artistic courses, Digipen Institute of Technology is a great school to explore. The BA program for 3D Animation/Game Development at Eastern Washington University teaches you how to use the standard tools needed for game development and 3D computer animation in general. If you already have a knack for storytelling and strong artistic skills, Eastern Washington University might be a good option. The BA program doesn’t focus on storytelling or art skills. Instead, it focuses on game development, motion capture, algorithms, character animation, and 3D modeling. If those are the elements that interest you, EWU is worth a look. You need “one year of a single college level foreign language” or “two years of a single high school foreign language” in order to enter the program. You can start on the bachelor degree path now by enrolling in their Associate Degree in Digital Gaming and Media program. You need that Associate’s Degree (or the Associate’s Degree in Graphic Design) in order to be eligible for the Bachelor Degree program. The Digital Gaming and Media Associate Degree Program at Lake Washington Institute of Technology will teach you the technical and creative sides of game development. As a student you can expect to develop skills in digital storytelling, creative design, technical design, and character development. After graduating, you can pursue careers in 3D animation graphics for gaming, education, marketing, or other interactive media. Of all the technical and professional programs at the Shoreline Community College, the Visual Communication Design Program is one of the largest. The Game Art and Design Associate Degree Program will help you develop 2D and 3D animation skills, with an emphasis on level design. The program will also challenge you to “conceive, plan, design and produce physical prototypes of games with characters and other assets, level, rules, and game strategy.” Despite their lack of a programming degree, Shoreline Community College offers introductory programming language courses. Part of this course takes place online. On the one hand, that lets you move at your own pace. On the other hand, you need to be self-motivated, or seek out advising help early in the program. If you’re looking for animation skills outside of video games, you can look into the Animation/ Video for Multimedia Associate Degree Program. This program will teach you storytelling and animation as it relates to video and other multimedia forms. You’ll learn concepts like illustration, typography, letter forms, and more. The BFA in Game Art and Design will teach you animation as it relates to creating and developing games. If you’re looking for a more general animation education, then the BFA program in Media Art and Animation is the program for you at the Art Institute of Seattle. The Art Institute of Seattle emphasizes the challenges inherent in the game design and digital storytelling industries.